We like complaining about it but no one can deny how much joy of hunting rare makeup gives. Did you find yourself opting for one over another because it was harder to get? Did you find yourself petting a rare brush, smelling an exclusive blush, sleeping next to a hard-to-find nail polish? I know, I know, these give pleasures like no one can understand but we do. Do we? Even after paying more than the twice of the item on evil Bay, I am asking myself, "where does it stop?". 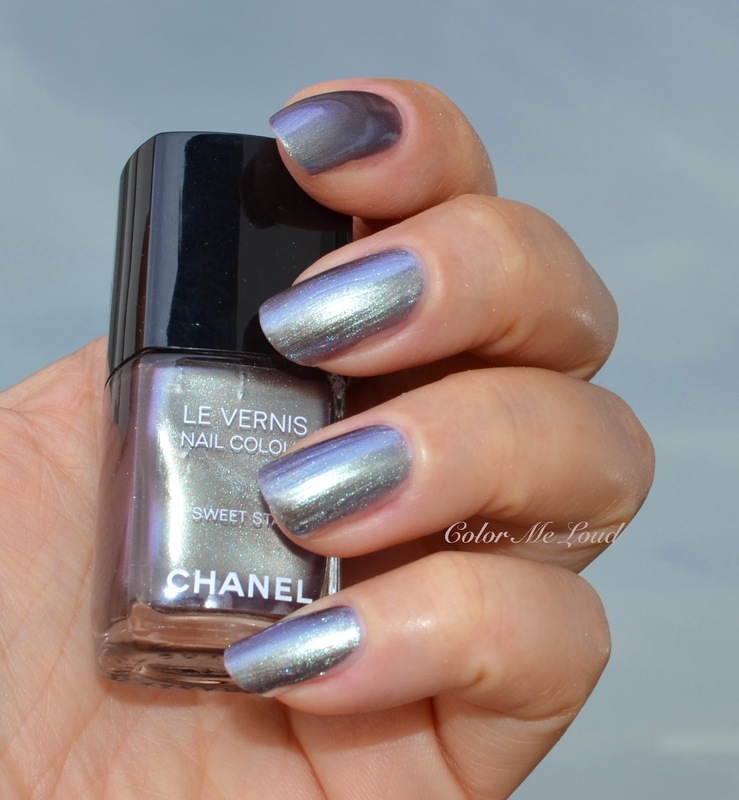 Don't worry though, this post is about a very pretty duo multi-chrome Chanel nail polish, not about me weeping about how much it costed. Once a year Vogue Magazine organizes a fashion event called Fashion Night Out around the world. The cities picked for this event are rather fashion capitals or big metropoles. Since two years the event is not being carried out in the States but in Europe it goes on as before. In Germany FNO takes place in Düsseldorf and Berlin. During the event Chanel usually releases a set of nail polishes specially designed for that day, which is very difficult to get hold of since one has to show up in person, at the right place on the right time. When it was taking place in the States, I was asking a friend to pick one for me from Chanel.com. It would go online even a week before the event took place. Last year I was fortunate enough since one of my best friends was in Berlin and she took them for me. This year I started to search for a solution a month before, asking at the forums, asking a few others... I was not lucky and time was running out. I might even gone so far and asked my husband to drive to Düsseldorf to pick up the nail polish (over 3 hours drive from here in one direction!). During my stay in Turkey I called the Chanel Counter in Harvey Nichols Istanbul and asked them if they could arrange one for me. They would, if they could. Because they didn't receive the nail polish yet! Anyhow let me introduce you to Sweet Star. It is green, it is purple and it is gray. It may even look bronze at some directions. 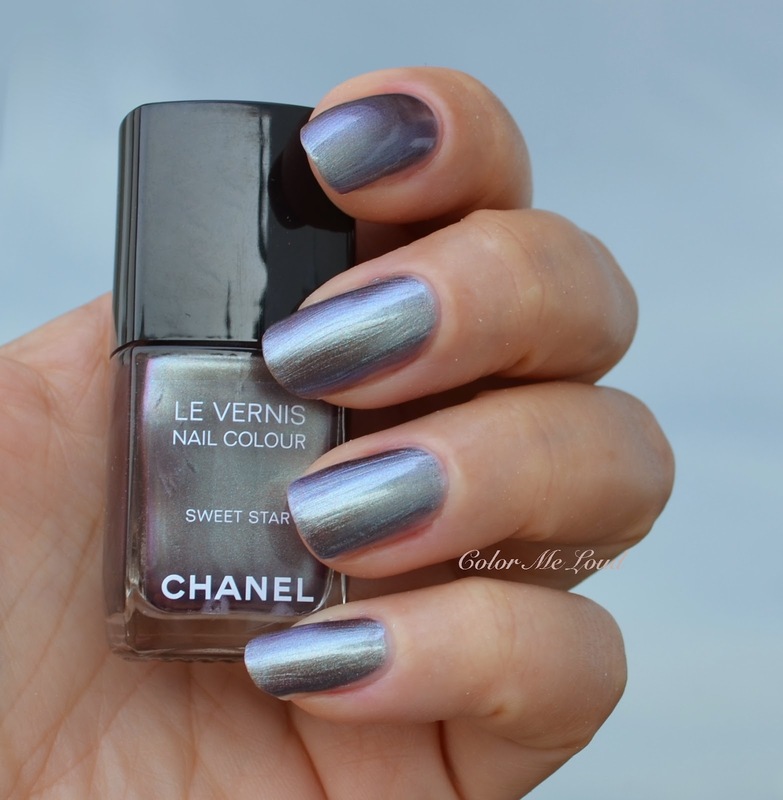 It is another metallic multi-chrome from Chanel, similar to Azure from Summer 2013 Collection. Sweet Star also has similar qualities in terms of shimmer under the sun or strong light, which are flashing green. I have made many photos to show you the different faces of Sweet Star. It is a unique and lovely shade, great for fall season since it looks like a complex grey most of the time. In terms of consistency, unfortunately mine was a little thin and showed all the imperfections on the nail surface. If your nails are not that smooth at the time you would like to wear it, I recommend applying a filling base coat first. The finish also is not free of brush strokes although I usually have a calm hand while application. If you hate brush strokes, this may not be for you either. I suspected I might have similar shades in my stash since purple green grey multi-chrome is a shade which is done before and I love collecting. I am happy to report though, Sweet Star was unique. Below you can see the base by the shadow comparison swatches (1st photo) and the shimmer by flash (2nd photo). Final thoughts: Chanel, very hard to get and very unique, read $$$ if you missed it. If it would be widely available, I would say, it is for those who like cool toned duo-chromes and who wouldn't mind somehow thin consistency and some brush strokes. Regardless of those, if you see it, be sure to get it. If you end up not liking it, you might have fun putting it up for sale and watching how high it goes. 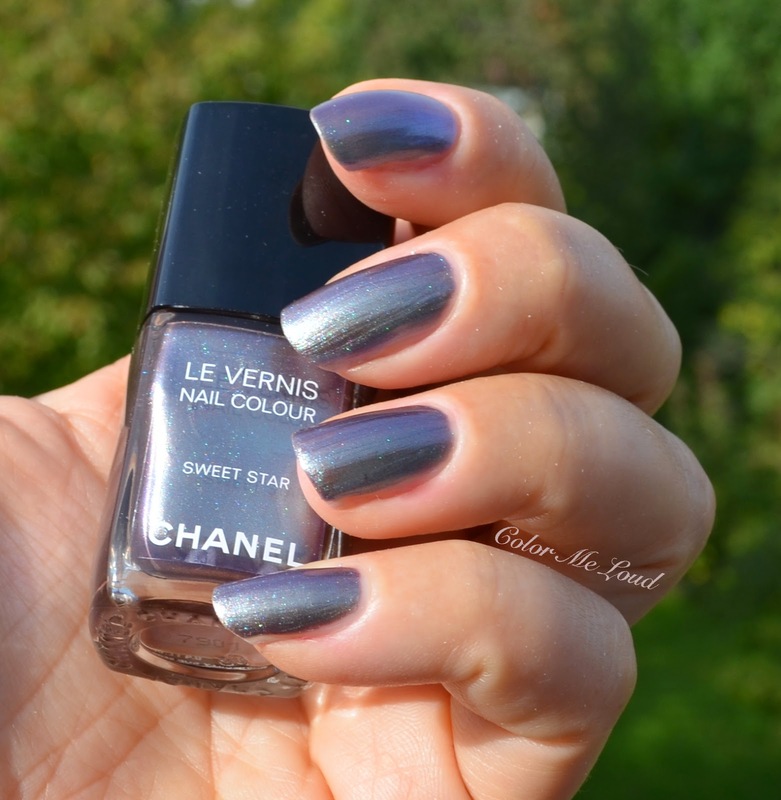 Notes on availability: If you are in France, you can order Sweet Star at Chanel's online store. It is not released in US yet, but it should be available soon. 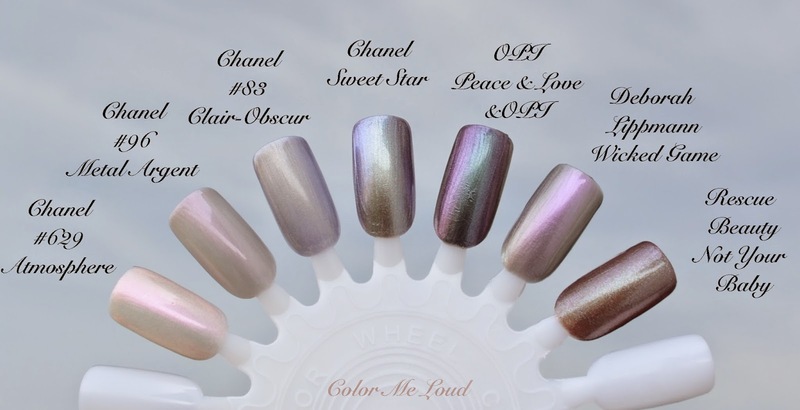 After I posted nails of the day on Instagram, __smk__ let us know that it is now available at Chanel Covent Garden in London and will be available at Chanel boutiques in France next month. With so much upcoming releases, I expect the prices to go down very soon. How much would you be willing to pay for a nail polish? Do you love or hate the very restricted releases? The things we go through for our obsessions. I resorted to ebay for a YSL LE polish (Gris Underground I think was the name) because only 4 made it to Taiwan and I wasnt one of the lucky ones who got it. Really annoyed me, because it didn't seem like a highly LE item in other countries, though it was a very popular one. Love Sweet Star on you, it's very unique and I love the gunmetal purple. If you don't mind the later launch dates (the FNO stuff this year wont be out till mid Oct), I'm very happy to help you get these items in the future. Taipei is one of the cities covered, and the Beauty Studio level store where these more highly LE items are sold is very convenient for me to access. that is really very nice of you to offer to pick items for me. I might really come back to you on that one ;-) Were you able to get Gris Underground. A reader asked me some time ago and I found it from a local swapping website. It was only slightly above the retailing price, like maybe a few € above but she didn't like it that way. I wished you would have asked me. I can help you get items like that, because here it was released everywhere, so some people have it and may want to sell it. I didn't know about Estee Lauder's product difference either. Very interesting. Oh wow, talk about a unique color/effect indeed! Love this! Yes isn't it so lovely?